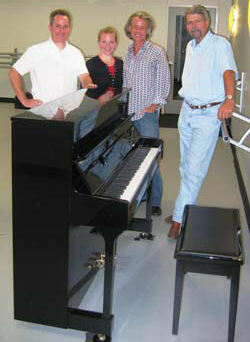 After nine months of construction, Ballet Austin's Butler Dance Education Center opened in May 2007 with new Wyman Pianos as part of the renovation. The renovation includes 7 new studios with fully sprung dance floors, and a 287-seat theater. With 34,000 total square feet, the Butler Dance Education Center houses the entire Ballet Austin Company including professional dancers, administrative, and Academy and Box Office operations. About the new Wyman pianos placed at the Ballet Austin Butler Dance Education Center, William Piner, Academy Director, said "we place a high premium on the quality of instruction and accompaniment offered at Ballet Austin, and the addition of these high quality instruments has been a big factor in our ability to set an even higher standard at our new center." "It's such a pleasure to play the new upright Wyman pianos at Ballet Austin's new studios," said Billy Wolfe, Music Director. "They are the perfect size for the dance studios, and their sound is very clear and strong and fills up the space. They also have a nice dynamic range, playing very softly for the delicate adagio combinations and resonating with a huge sound for the grand allegro jumps. The studios and pianos are in constant use from early morning to night, and the Wyman pianos consistently produce a great sound for us, hour after hour, day after day." Robert Strait, owner of Strait Music, helped to facilitate the placement of the Wyman Pianos at Ballet Austin saying, "It's been exciting to place Wyman pianos in the Butler Center. The pianos have proven to be of excellent quality, superior sound and lasting durability, something Ballet Austin will always be able to rely on." "Wyman Piano Company is pleased to have been selected by the Ballet Austin Butler Dance Education Center," said Tim Laskey, president of Wyman Piano. George Benson, Wyman national sales manager, said "It gives even more creditability to our instruments, demonstrating they are of superior quality and able to withstand the rigors of being played continuously in a professional musical setting." Picture left to right: Billy Wolfe, Academy Music Director; Jaime Lynn Witts, Company Dancer and Academy teacher; William Piner, Academy Director; Robert Strait, Strait Music. To learn more about Wyman Piano Company and how to become a dealer visit our contact page, call 941.661.0200, or e-mail info@wymanpiano.com.